Strawberry season is outstanding this year in Southeast Michigan. This morning I spent 1.5 hours at Rowe's today, and picked 35 pounds. That's nearly 12 pounds every 30 minutes. The berries were so plentiful and ripe, it was almost impossible to not find a good spot to pick. Last week's hot weather ripened up the berries, and they are at perfection right now! And if we're lucky, that perfection will last for several more weeks. I went by myself, but I was't alone. Lots of families were out with their children. While I picked I got to enjoy other people's stories, like the mother who talked about how she has a bowl of apples, and her young daughter once took a bite out of every apple and put them back in the bowl so that the bites were not visible! Said daughter was busy eating strawberries almost faster than they could pick them. Rowe's Produce Farm — this has been my go-to farm for strawberries for years. (Mainly because they are the closest one to me.) Get on their email list and get up-to-date announcements on crop conditions. Whittaker's Berry Farm — out in Monroe, past Dundee. They also have an email list. DeGroot's Strawberries— people on the NW side of Washenaw County may find DeGroot's more conveniently located. Long Family Orchard — north of Novi in Oakland county. Their strawberry season does not appear to have started yet. Other u-pick farms in SE Michigan — pickyourown.org has a regional list of Michigan u-pick farms. Joe and I are very excited to be writing restaurant reviews for Current Magazine. Our first article, an Ann Arbor summer patio/al fresco brunch dining guide, was in the May print edition and is now available on the eCurrent website. With limited space, we had to make some editorial decisions on what to include, so we know we left out some great places. We'd love to hear your favorite brunch or lunch place with outdoor dining in the Washtenaw County area. In a tradition dating back to 1897, the Senate Committee hosts Obama's first luncheon. They've made the inaugural recipes available for download from their website so we can all eat like a president! 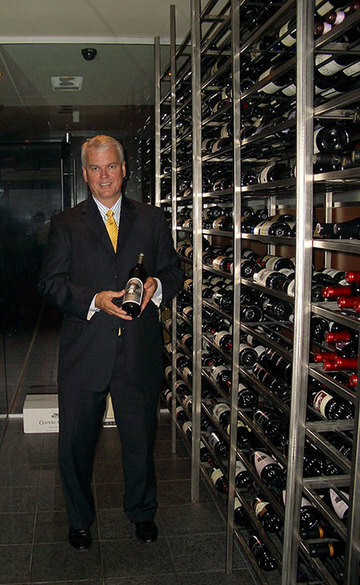 General Manager Terry Martin shows off one of the fine selections from Melange's wine cellar. Last week I received a call from Constance Crump. Would I like to attend a Meet & Greet at Mélange? Sounded like fun to me! I slid out of work a bit early (5:30 is normal for me, so 5 is early!) and headed into town. North-bound Main was a parking lot at 5:15pm. (Is it like that every day?) I managed to skirt around it and scored a primo street spot on Liberty. Mélange is right near The Ark. The main entrance is a beautiful staircase with bamboo stalks lining one wall. (The handicap entrance, a must if you need to avoid a long staircase, is through The Ark.) The restaurant is all muted oranges, yellows, and browns. It takes a moment for the eyes to adjust, but the effect is a very cozy and private feeling. That modern glassed-in wine cellar you see above divides the bar from the main dining room. Mélange recently launched a new menu under Executive Chef Sam Ness, who has worked, among other places, at Nobu in New York. In addition to their pan-Asian menu, they have a full sushi bar. The sushi we had was excellent, and the menu selection is extensive, with both traditional favorites and some exotica. Sushi prices are surprisingly reasonable. (And during their 5-6pm happy hour, you can give their sushi menu a try at half-off.) Their dinner menu also looks good — watch for a more complete review of Melange when we go there for dinner... soon, I hope. I enjoyed a glass of Two Brothers Big Tattoo Red 2005, a nice easy-drinking red with lots of berries in the aroma. The eponymous two brothers, Alex and Erik, created this wine to honor their mother, who suffered from breast cancer. For every bottle sold, they donate 50 cents to the Arlington, Virginia Hospice and to a breast cancer research foundation in their mother's name. 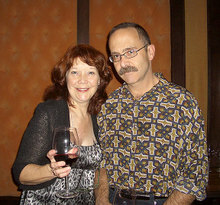 Myrna Rugg (pictured at right with her husband Rick Cronn) is the Treasurer of the Ann Arbor Film Festival. I know it's a great film festival, but what I didn't know is that the AAFF is the third oldest film festival in the world, after the Venice Film Festival and Cannes. They made news in 2006 when state legislators attacked them for showing "objectionable" films and attempted to pass legislation to single out the AAFF and deny them state arts funding. In turn, the board voted to forego state funding so that they can continue to uphold the Festival's artistic integrity. They are seeking community support so that they can continue to bring independent and experimental film and video to Ann Arbor. The 46th Ann Arbor Film Festival will be held March 25-30, 2008 at the historic Michigan and State theaters. If you'd like to support the AAFF and see this wonderful world-famous film event continue, you can make a donation. (The AAFF is non-profit. All donations are tax-deductible.) As an added bonus, with your donation you get to vote for what "Act of Audacity" the AAFF crew will perform in public. If you were one of the lucky people to see the Glam Rock street performance on Oct 17 (I was not, sadly), you saw the first Act of Audacity. 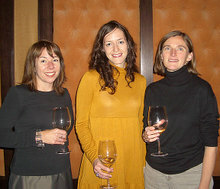 But last night I had the luck to meet Maria, Shana, and Anne who blog about food and the AA restaurant scene at The Gastronomical 3. (pictured left) They're giving the Annabella Chardonnay 2005 a try (crisp, sweet, lots of tropical fruit aromas and an oak finish). Go check them out. And finally, none of us would have been there but for Constance Crump. Long time Ann Arborites may remember her and the Crumpettes' food adventures in the Ann Arbor News. Thank you, Connie! A big thanks to Tanya Muzumdar and metromode online magazine for the shout out. 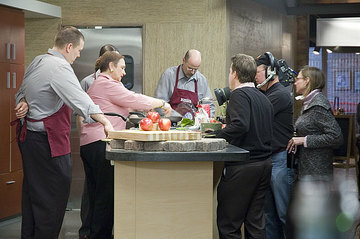 Check out Tanya's article on gourmet and speciality grocery stores. I have to say that I'm delighted to learn about Plum Market and See's Candies. I fell in love with See's Milk Chocolate Bordeaux chocolates a year back when a friend had them at her wedding. Mmmmm. These were heaven. Back when I was a child, I remember my grandmother volunteering for a local organization that found food for hungry families. Once a month or so, she'd spend the evening sitting by her rotary dial phone to receive calls from families who had no food and to direct them to various local community resources where they could obtain food. Poverty and hunger in the US has, sadly, only grown since that time. With that said, although there's just a month left in the campaign, it's not too late to participate in the Great American Bake Sale. Organized by Share Our Strength, a nation-wide nonprofit that brings together individuals and businesses to end hunger, the Great American Bake Sale raises funds that are distributed to community organizations that work to increase participation by low-income children in summer and after-school feeding programs and to support nutrition education programs for low-income families. 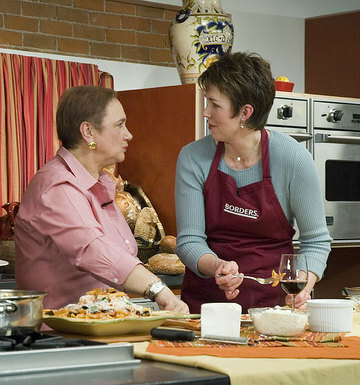 The Great American Bake Sale has raised over 3 million dollars since 2003. In 2005, they sent 91% of bake sale proceeds to organizations across America to fight childhood hunger, which is an excellent ratio. In Michigan, community organizations that receive funding from the Bake Sale include Mayor's Time,Inc. in Detroit and the Center for Civil Justice in Saginaw. I wish I had learned about this earlier! The Great American Bake Sale sounds like a fantastically fun way to be part of a nationwide grassroots movement to raise money to fight hunger. I'm wondering if I can squeeze in a bake sale somehow in the next few weeks, but even if I can't, Mercedes Bent of Share Our Strength has told me that anyone can have a bake sale and donate the proceeds to the program any time of the year. EDITED: Want to know what they're serving today? 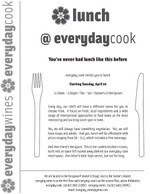 Check out the everyday lunch blog. It's generally updated by 7:30am with the day's menu. Local food news seems to be the order of the week. Long time readers may remember me gushing over Chef Chewy at Monahan's lunch counter. You can still get fabulous seafood at Monahan's and enjoy lunch at the counter, but if you're looking for Chewy's cooking you'll now have to go to upstairs to everyday cook. Click on the image at left or download this pdf flyer for the full scoop.